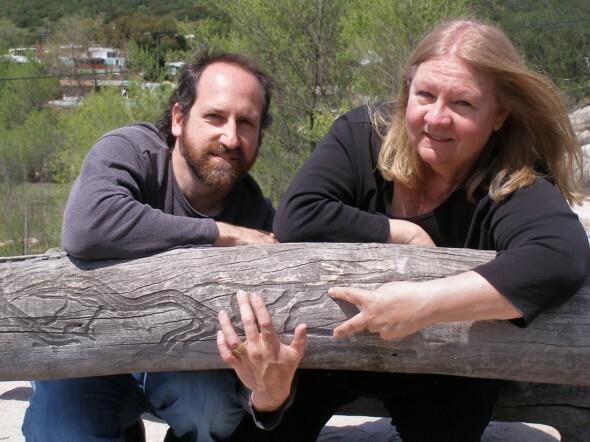 Debby and Larry Kline are collaborative artists, whose works have been featured in many solo exhibitions, including Mission Cultural Center for Latino Arts (San Francisco), California Center for the Arts Museum, La Casa del Tunel Art Center (Tijuana), Southwestern College Art Gallery, UCSD Cross Cultural Center Gallery, Mesa College Art Gallery and Athenaeum Music and Arts Library. Group exhibitions include Indiana State Museum, San Diego Art institute, Torrance Art Museum and Museum on the Seam (Israel), which involved traveling to Jerusalem and creating a one ton adobe structure on the roof of the museum as part of an exhibition of international environmental artists. Book credits include “The Artists Guide,” by Jackie Battenfield and “Design and Ethics: Reflections on Practice,” by Felton, Zelenko and Vaughan. The Klines participated in The Center for Land Use Interpretation’s residency program through a grant from UCIRA. They have also been awarded three grants from The Gunk Foundation, NY, and grants from Potrero Nuevo Fund, San Francisco, Center for Cultural Innovation, Los Angeles, and the 2013 San Diego Art Prize and Established Artist Grant. They were also featured in an Emmy Award winning episode of ArtPulse TV in 2014 and were awarded the Calzona Prize in 2016, winning a plot of land on the border of California and Arizona, to create earthworks relating to the formation of the Salton Sea. In 2018, they were awarded consecutive artist’s residencies at San Diego Natural History Museum, Torrance Art Museum and UCSD School of Medicine.